Chef/restaurateur Alessandro Pirozzi is growing his Italian-focused culinary empire with the launch of his latest concept Salerno by Chef Pirozzi. Based in downtown Laguna Beach, Salerno is the third restaurant in the coastal city run by Pirozzi, joining Alessa Laguna and Mare Culinary Lounge. The chef’s other OC restaurant is Pirozzi Corona Del Mar. Salerno by Chef Pirozzi, 220 Beach St., Laguna Beach, CA 92651, 949-497-2600. Located on the main drag of tiny Balboa Island, Mr G's patterns itself on the style of a cozy California bistro. Its unfussy black and white color scheme adds a touch of refinement to the relaxed, Balboa-appropriate ambience. The menu features a modest array of contemporary fare, from small bites like mussels and meatballs to handmade pastas and entrées such as filet mignon with parsnip and wild mushrooms. A compact list of wines and beers is also available. Lunch & Dinner Tues.-Sun. Mr G's, 305 Marine Ave., Newport Beach, CA 92662, 949-675-6193. Upscale taqueria concept Puesto will make its Orange County debut in early 2017. Known for creating classic Mexico City-style street tacos with locally sourced ingredients and from-scratch salsas, the venue will be located in Irvine’s Los Olivos Marketplace, a stone’s throw away from the Irvine Spectrum’s massive sprawl. This marks the third locale for the eatery, which also has outposts in San Diego and La Jolla. Puesto, Los Olivos Marketplace, 8577 Irvine Center Dr., Irvine, CA 92618, no phone. Chef Pascal Lorange is opening CRUDO by Pascal Lorange in the summer of 2017. The new venue will be located in Costa Mesa’s The Westin South Coast Plaza in the space formerly occupied by Pinot Provence. 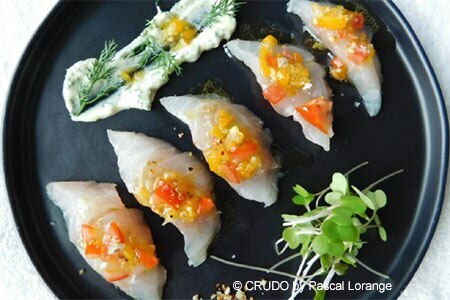 Crudo adds to Lorange’s lengthy résumé that includes helping to launch Fig & Olive’s collection of restaurants and on a few occasions cooked at private dinners attended by luminaries like Princess Stéphanie of Monaco and Barack Obama. Simply prepared Mediterranean fare with a focus on seafood will be the highlight. CRUDO by Pascal Lorange, The Westin South Coast Plaza, 686 Anton Blvd., Costa Mesa, CA 92626, No phone. Orange County Restaurant Week returns to showcase some of Orange County’s best and brightest dining venues and culinary talent. Now in its ninth year, the week features 100 of OC’s top eateries rolling out special multi-course, prix-fixe menus ranging from $10 to $20 for lunch, and $20 to $50 for dinner. Participating restaurants include Anchor Hitch, Ironwood, Lucca Cafe, SeaSalt Woodfire Grill, Selanne Steak Tavern and The Ranch Restaurant & Saloon. The week kicks off with a special “First Bites” launch party, held March 4th at the Irvine Marriott. For more information, please visit the official website. Jay Lacuesta has taken the reins as executive chef at Twenty Eight. He replaces Shirley Chung, the celebrity chef who helped launch the Irvine eatery in 2014. A protégé of chef José Andrés, Lacuesta has been with the restaurant since it opened. With his new position, he has created a modern, meat-centric menu that emphasizes seasonal ingredients and a more subdued Asian influence. Twenty Eight, 19530 Jamboree Rd., Irvine, CA 92612, 949-852-2828.